A2Z Insurance & Financial Services Thanks your Kind Support and Appreciate your Efforts to make us Successful. Thanks to all my Clients, Channel Partners and Business Partners. Why A2Z Insurance & Financial Services? As an independent Insurance Service Provider, A2Z Insurance & Financial Services provides exceptional Insurance & Financial Services with the most affordable Prices. With over 10 Years Experience in Haryana, A2Z Insurance & Financial Services guarantees a protection plan that will meet specific needs to each of our Clients and Channel Partners we protect. We take pride in making sure that each policyholder understands the value of having options, by allowing you to create a policy that will fit your individual needs. We as an Individual Incorporated in General Insurance Line for Last about 10 Years and Serving our Channel Partner with our Best Insurance Services. We insure everything from A2Z. A2Z Insurance & Financial Services is your dedicated Insurance Agency, Serving the community of India. As your local source for Insurance Services and Financial Solutions, our entire Staff prides itself on offering personalized and responsive Customer Support to our customers throughout the Nation. At A2Z Insurance & Financial Services, our ultimate goal is to create lasting relationships with each of our clients so that we may continue providing excellent service for many years to come. Our experienced staff members can outfit you with tailored solutions for your Auto, Home, Business Insurance Requirements and Personalize Each Insurance Product to your specific individual needs while providing competitive rates for our valued clients. 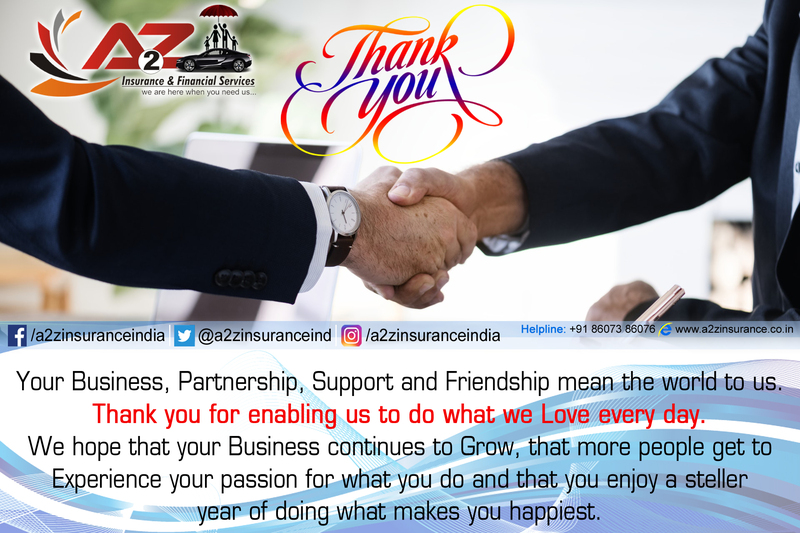 A2Z Insurance & Financial Services Team is committed to providing clients with the highest quality Insurance Plans available combined with some of the lowest rates available in all of India. Whether you're shopping for Auto insurance, Home insurance, Travel, Health, Life or SME Business Insurance, we can help get you the best coverage available with the lowest rate possible. Although A2Z Insurance & Financial Services primary area of service is located in Hisar (HR), we offer unparalleled service and competitive quotes to Clients throughout the Entire Country! Mission: As an Independent agency, with office in Hisar, HR, our Professional Insurance Agents will evaluate your risks and offer solutions with companies that best suit your needs. Our experience and affiliation with carefully selected companies allow us the flexibility to meet most diversified needs for the best possible value. By offering coverage for Automobile, Homeowners, commercial and other Insurance & Financial needs we can offer a package policy which includes discounts to our clients. Operating Philosophy: Take care of our clients by offering a company for every situation in conjunction with exceptional customer service. The relationship we build with our satisfied clients and their referrals is our basis for continued growth. An independent insurance agency with the customer in mind. Access to dozens of insurance companies, allowing you to get the best coverage, service and rates available. Ideal history or not so perfect history, we find the right coverage, with the best company, at the best price. No matter your location, you can be sure we have the ability to protect your most valuable assets. We're here for you twenty-four hours a day, seven days a week. Call, Chat or fill out an easy form. Your Home, Vehicle, Office, Life, Business Premises, Farm, Shop, Store and so much more is Covered. Tell us about yourself one time; we shop for the best price as opposed to calling different agencies for each bit of Insurance. Trust that we will tell you all of your options not just the lowest cost and explain clearly the differences so you can decide what's best for you.